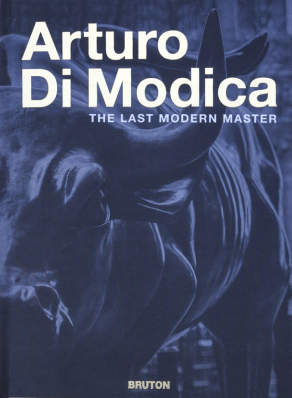 It was in the middle of the night on the 15th December 1989 that Arturo Di Modica and a small group of friends arrived on Wall Street with Charging Bull, his 16ft bronze masterpiece, on the back of a flatbed truck. Di Modica had spent the last few nights scoping out the location and monitoring the security routine so he knew he had precisely four and half minutes until the guard returned. But he was shocked. A gigantic Christmas tree had been installed since his last visit just where he was planning to leave the piece. But the clock hands moved remorselessly on. ‘Drop the Bull under the tree”, he told his posse. ‘It’s my gift’. You have to step back to 1941 when Di Modica was born in Vittoria, Sicily, to understand this unprecedented art action, indeed his entire body of work. He had been born shortly before the Allied forces invaded, so it was into a world of conflict, and he grew up surrounded by the ruins of ancient Greek and Roman, which was a visual education in human ambition, the need for fortitude and, at least for Di Modica, the huge possibilities of art. Di Modica made a key move at the age of 18. He had decided that his pursuit of an art career required that he leave his birthplace and move to a cultural hub, so without telling his family he boarded a steam train to Florence, one of the powers of Renaissance Italy. His early years there were hard, dedicated to work at his sculpture, while he supported himself by taking a string of poorly paid jobs. Unable to afford the local foundries, Di Modica was very much thrown back on his own resources and applied himself to forging his own tools, using salvaged materials. He would then cast his earliest bronzes in a foundry he had built himself. This barebones approach, though, would prove rewarding in terms of craft, a matchless learning process, and Di Modica’s efforts culminated with his first solo show: A 1968 exhibition of rough castings at the esteemed Villa Medici. Soon after he was working in the same Carrara studios as Henry Moore, the British great, who nicknamed him ‘the young Michelangelo’. By the early 70s Di Modica felt he had learnt what Florence had to teach him and made a second key move - New York City. Di Modica set up his first studio on Grand Street in Downtown Manhattan, this being just when that area was replacing the Upper East Side as the center of New York’s art world. It was also just then that Street art/graffiti were becoming a cultural phenomenon and Di Modica was a rare studio artist to be part of that, often parking his huge marble abstractions outside his studio on the sidewalk. It was also appropriate that it was just here that he caught a young artist spray-painting his studio door. That was Samo aka Jean Michel-Basquiat. In 1977 Di Modica had a show in Battery Park and telephoned Hilton Kramer, the then lead art critic of the New York Times. Kramer hung up on him. It was this casual disrespect which motivated Di Modica’s first Art Action. He loaded sixty tonnes of his marble abstractions onto the back of a truck, drove to Rockefeller Center, just off 5th Avenue, where he and the driver of the truck dropped off the works with no prior permission. After being confronted by four NYPD officers and issued with a $25 fine by Mayor Abe Beame, he was granted the right to leave his work on temporary exhibit. And the next day, he was on the front page of the New York Post. A valuable lesson was learnt. On October 19th 1987 Black Monday struck the financial markets. Many, many Americans were left reeling. Arturo Di Modica was living the life of his dreams. His work was being acquired by some of the world’s most important collectors and he was making that work in a studio in his own five storey Manhattan building, which he had built by hand, while allowing himself such indulgences as a Ferrari 328 GTS. The United States had made all this possible. That was when and why the Charging Bull was born. Di Modica’s next two years were spent creating this masterly 16ft bronze, with the $350,000 costs coming out of his pocket. So his discovery that a Christmas Tree had been installed just where he was going to put it could not have been more appropriate. This would be his gift to America and to the American people, Charging Bull would encourage them to battle through tough times towards a brighter future. Di Modica’s Rockefeller Center action had been huge news, but in New York only. That had been the first act. After it had been put in place Charging Bull went global. The piece draws millions of visitors every year. It is as widely known as Michelangelo’s David, the statue in Florence, the city where his career began.